What is the PhysioRoom.com Elite Hinged Knee Brace? A high quality knee brace, designed for the treatment of knee ligament injuries and cartilage tears. Provides excellent support and fits beautifully. For all knee ligament and cartilage injuries and knee arthritis. 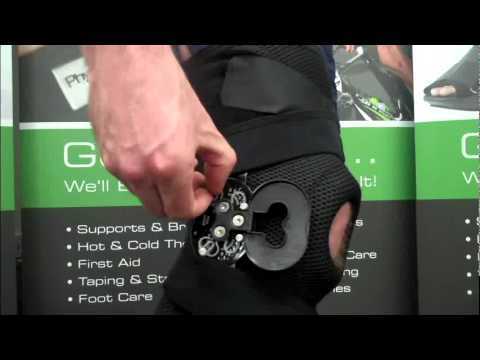 Ideal for the stiff, weak or painful knee and as a rehabilitation knee brace following knee injuries. Breathable Airmesh fabric makes it perfect for light sports and skiing. Measure around the centre of the knee. If you are between sizes, please choose the larger size. This product can be used on either the left or the right knee. The PhysioRoom.com Elite Hinged Knee Brace features an adjustable ROM hinge, which allows 0-90 degree flexion and extension to stabilise the joint and prevent hyper-extension, thus reducing the chance of an injury re-occurring. Removable pins allow the wearer to set the hinge, limiting the knee's range of movement and speeding recovery during the rehabilitation period. Because its Airmesh breathable construction allows air to circulate freely, the Elite Knee Brace can be worn for extended periods of time. Its four-way stretch, multi-filament fabric ensures a supportive fit and comfortable cushioning. To wear, simply pull this all-in-one knee brace over the leg and adjust the tightness with the Velcro straps. You can then set the hinge to the desired range of movement for the knee. Hinge includes 4 adjustable stops for restriction of movement to prevent overextension of the knee.